Last year, Frankie had five of his teeth pulled. The vet said he had cavities (different from human cavities), which is unusual for dogs. This July, Frankie’s breath was smelling really bad–worse than dead fish mixed with poop. We brought him to a vet who specialized in canine dentistry. 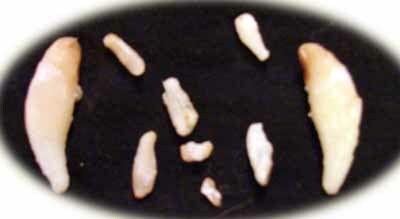 Besides having cavities, his bone was reabsorbing his teeth, and he had exposed rotting bone in the back of his mouth. Frankie ended up getting all but 6 of his teeth pulled! 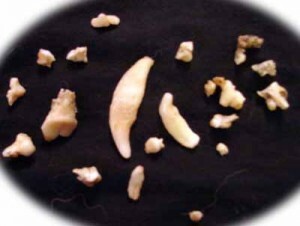 While Nutok was getting stitched up at the vet from her unsuccessful attack on Monkey, the vet noticed she had a fractured tooth and let us know we should get it taken care of. We brought Nutok to the same vet as Frankie (the vet who specializes in dentistry). What we thought was going to be a straight forward procedure of removing one tooth turned in to a longer procedure that involved removing 8 teeth! She’s still in the recovery phase and has a checkup next week. For the last several years, Neptune has been vomiting his dinner once a month and appeared to have tummy problems every now and then. I brought him to the vet and was told to give him pumpkin…and that as long as things were going in one end and coming out the other, and occasional vomit is okay. In August 2009, he seemed to be getting worse. He would vomit 3-4x a week, seemed lethargic, not his usually self, and he was loosing weight. Turns out Neptune had a small piece of rawhide (we think) floating around in his stomach. Every now and then it would block the path from the stomach to the intestines, thus causing him to vomit. The rawhide was surgically removed from Neptune’s stomach. The vet thought the rawhide had been in his stomach for a while! Rawhide removed from Neptune’s stomach (left) compared to a quarter (right) to show size. Next Next post: Scully Returns from the Dead!